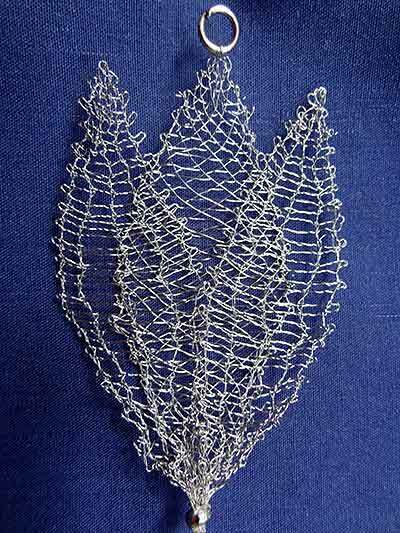 Ever since my education as a lace teacher and even before that I make my own designs. These can be for my lessons, workshops I give, projects of the lacegroup of which I am a member or just for my own to build a collection which can be exhibited or maybe sold. 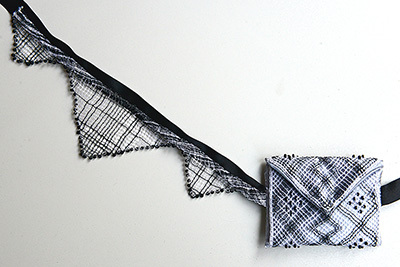 This little bag in black and white with decoration on the strap has been designed for a workshop of the LOKK this year. 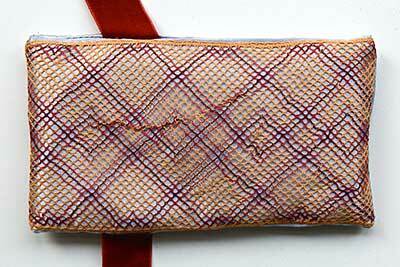 The same design could also be made as a bag for a smartphone. 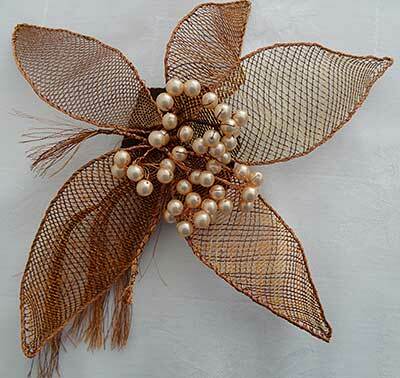 This fascinator has been designed for the exhibition last year for one of my lacegroups. To wear it as a fascinator it has to be attached to a diadem. Without that it can be used as a corsage. This pendant has been designed last year for a competion for better Dutch souvenirs. But because of a maximum retailprice of about € 60,00, I did not enter the competion. I could not make it for that price. 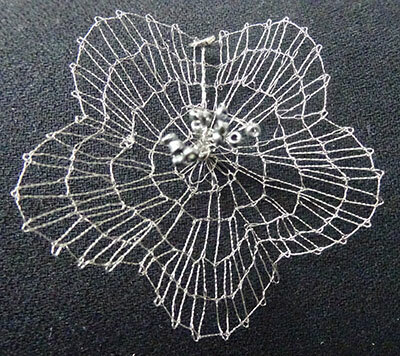 This was a challenge for me after publication of the tulip in wire: Make a rose in wire. 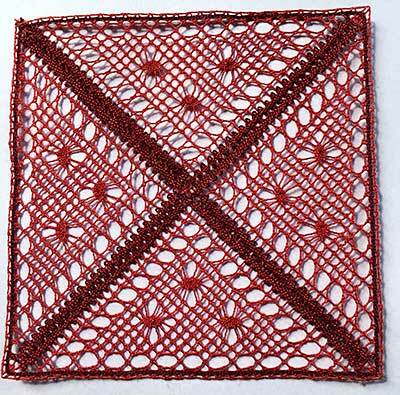 Within a square of 10 x 10 cm it possible to make a design. This is an example. 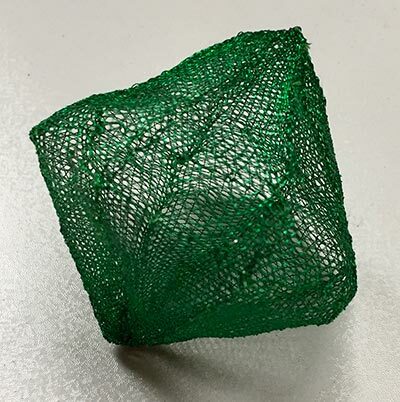 This emerald is designed and made in 3D. It is made for the presentation of the lacegroup ’t Aemstelkant on the Jubilee event of the LOKK in 2018. 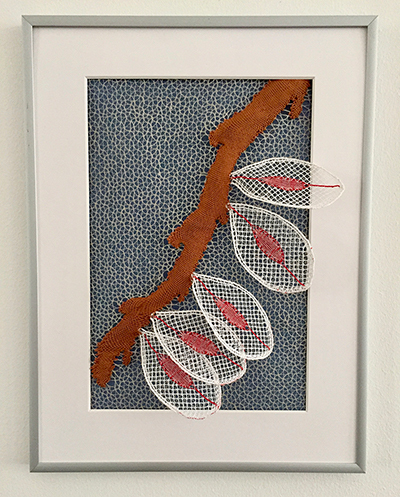 I designed this elm branch after the Spring Snow Festival in Amsterdam. Along the canals there are many elm trees. The seeds falling on the roads cause the “springsnow”.